But this has been no ordinary year. 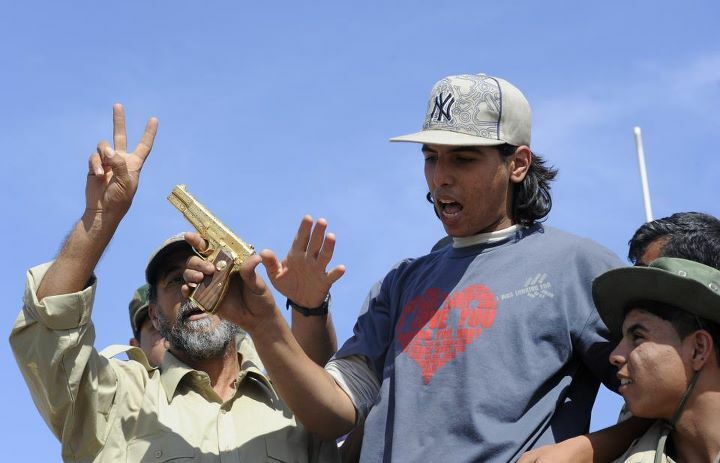 Governments have fallen in Tunisia, Egypt, and Libya, and there are ongoing conflicts in Syria and Yemen. Bahrain's sectarian clashes were put down by Saudi intervention. Many of the Hajjis will bring the concerns and preoccupations of their home countries to the holy city Will there be any trouble? In the now more than 30 years since the Iranian Revolution, Iranian pilgrims have often created a flashpoint; Saudi suspicon of (and repression of) Shi‘isam combined with Iran's revolutionary fervor created a volatile mix. This year, Iran is officially saying it hopes for a "calm" Hajj. A possible augury to the contrary is the reported detention on his arrival at the airport of a prominent Canadian Shi‘ite Imam. Saudi Arabia has spent a lot of effort through the years on Hajj security (including helicopter monitoring), and seeks to avoid the stampede-like conditions which have led to deaths in the past, but the concern about Sunni-Shi‘ite tensions in Bahrain, Syria and elsewhere may lead tos ome heavy-handedness. It will also be interesting to see if it rains. Mecca gets only about an inch of rain per year, on average, but in 2009 heavy rains hit Mecca as the Hajj was getting under way, and in 2010, rains came again toward the end of the Hajj. Needless to say, the pilgrims interpreted the rains as a sign from heaven. Would the interpretation be any different in a revolutionary year? From Carnegie: Nathan Brown on "Post-Revolutionary Al-Azhar"
I haven't read it all yet, but it looks like something I should share. Nathan J. Brown is very good at what he does, and his new report from Carnegie, "Post-Revolutionary Al-Azhar" looks worthy of all our attention. That's the info page; here's the full report in PDF. As might be expected in a country that never had real election results before, has no majority party and has some electoral disputes, Tunisia's future is almost as confused now as it was on Friday, if not more so. This is a wonderful thing to see in the Arab world. I continue to urge you to follow events here (if you read only English: French and Arabic speakers can go straight to the Tunisian press) between my own posts. after the surprise third-place party, Aridha Chaabia, had nine of its electoral wins cancelled over allegations of campaign financing violations. In Sidi Bouzid, in fact, Aridha was actually running ahead of Al-Nahda. Its leader has called on its remaining winners (it still has about 16 seats that were not invalidated) to withdraw from the Assembly. Meanwhile, the protesters in Sidi Bouzid attacked governnment offices and reportedly tried to burn Nahda headquarters, an unfortunate aftermath to an otherwise remarkably open election. Now there are the usual accusations and conspiracy theories in the air. For good English coverage of the aftermath and the maneuvering over the interim Presidency (Nahda's Hamadi Jbali is expected to become Prime Minister), as well as the Aridha controversy, tunisia-live.net's Politics pages are a good resource. Barring something major, I'm signing off for the weekend. Nevertheless, it would be quite wrong to presume, as many commentators and analysts have concluded, that what the recent clashes in Egypt tell us most about is a sectarian or religious conflict between the military and the Egyptian Copts. Rather it uncovers the sense of empowerment and self-inflation of the SCAF in the face of all Egyptians, regardless of their religion or political affiliation. While the religious dimension cannot be ignored in such a pious society, the main message is about the costly nature of Mubarak’s legacy. Those who protested on Sunday bear many of the same grievances as those who rally to Tahrir Square every Friday, calling for civilian rule. 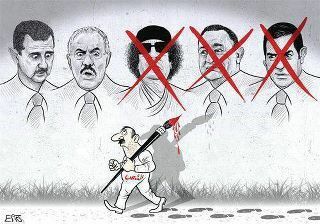 They are all victims of the chronic problems inherited from Mubarak’s reign. It would be unrealistic as well as unfair to portray the Egyptian army as a sectarian entity with respect to the Copts. This may be a subtle distinction, between the habit of divide and rule and sectarianism, but a crucial one to understand in the Egyptian context. 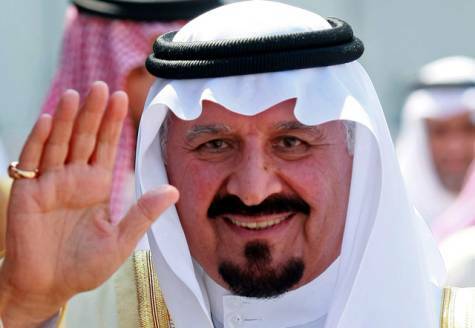 The designation of Saudi Arabian Interior Minister Prince Nayef as Crown Prince should have come as little surprise, having been signaled years ago, , though the reaction of many Saudi tweeters and bloggers suggests that hope still springs eternal, against all the odds. Nor will many Western countries be terribly enthusiastic. In a country where "reform" is discussing giving women a vote for powerless councils and someday, perhaps, the right to drive a car, Nayef is considered the opposite of a reformer. Though suspected of sympathies with extremists at times, he has been tough on terrorism in recent years. A full brother of the late King Fahd and the late Prince Sultan, he is one of the full brothers known to Westerners as the "Sudairi seven," sons of King ‘Abd al-‘Aziz by Hasa bint Muhammad al-Sudairi, and also known as the Al Fahd. I'll post a fuller analysis tomorrow, but with the final (though I don't think fully official) results in, Al-Nahda will have either 90 (or, from this count, 91), seats in the Tunisian Constituent Assembly, out of 217. A bit over 40%. The surprise dark horse, Aridha Chaabia, has had its results disqualified in six districts due to improprieties, and may withdraw from the Assembly. I'll have more on that tomorrow. Though as of this writing only 192 of the 217 seats in the Tunisian elections have been declared, and I had a fleeting thought along the lines of, "This is taking longer than most Arab elections results," I then reflected a moment and realized that's a good thing. For the first time, 1) they're actually counting the votes, and 2) they waited until after the election to count them. You can get the results out more quickly if you tally up the totals before people vote, but Tunisia is doing it differently for once. And So it Begins? 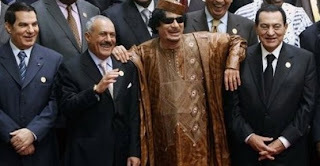 Tantawi for President? You may recall a bit of a flap in September when Egypt's Field Marshal Tantawi, a man so rarely seen in public that many Egyptians only learned what he looked like after he became the effective head of state, and who in the first several months after the fall of Husni Mubarak made precisely one public speech, casually strolled through downtown Cairo in civvies, specifically a business suit. Except for one photo of him at a wedding in what may be the exact same (his only?) civilian suit, no one else had seen a photo of him except in uniform. That raised suspicions he might be harboring ambitions of running for office, despite the fact that he has never shown any political skill, ambition, or charisma (which is, of course, why Mubarak liked him). He has, however, been appearing in public a lot more. Well, despite his previously undetectable political appeal, a group called "Egypt Above All" has been putting up posters in Cairo and Alexandria calling for Tantawi to run for President. Here's an Arabic Facebook discussion complete with an image of an Arabic article. If there's any groundswell for Tantawi from anyone not in uniform, I'd like to see what employment they held under the Mubarak regime. If the new regime starts to look like the old regime, as it's tending to do right now, I hope they remember that those who brought down one regime have tasted their own power, and Tahrir Square is still there. And not everyone in the Army is a Major General. I say back to the Barracks as promised. Or back to Tahrir. Even leaving aside the Deutschland über Alles feel of "Egypt above All" (Misr fawq al-Jami‘). Arabist on "What Egypt Might Learn from Tunisia"
Issandr El Amrani (The Arabist), just returned from Tunis, offers his views on "What Egypt Might Learn from Tunisia" at Al-Masry al-Youm. And at his blog, check out his separate concerns about Egypt's elections. Google Reader is one of Google's many free services; it's primarily a reader for RSS feeds. While I have used it for that, I was — I suspect like many other users — unaware that it had social sharing features as well. Google recently announced that it will be removing those sharing features from Google Reader and merging it more closely with the social networking features of Google+, Google's challenger to Facebook. Google Reader, which thanks to its social features (which are going to be removed), is much more than a simple RSS reader for Iranian users. Google Reader is not in a separated domain (like any other Google product) and thanks to https protocol, it is hard to filter by government (To filter google reader the whole google.com domain should be filtered). In a country which all social website like twitter, facebook, friendfeed, and video or image sharing websites like youtube, tumblr, flickr, picassa and many more are banned, Google reader acts like a social websites and in lack of any independent news website (it should be mentioned that all international news channels like BBC, CNN, VOA, and all other non-governmental news website are banned,) Google Reader acts like a news spreading website. Easy access to Google reader made it suitable for Iranian community and through all these years, specially after June 2009 election, developed an strong community for spreading the news. Users like VahidOnline, with more than 7500 followers acts as a hub for spreading and sharing the news from different sources like many other popular users. Commenting space of popular users are also like a forum for discussion about the news and events! Websites like Balatarin (digg like Iranian website) with 60000 subscriber, kaleme.com which represents green movement news with more than 12000 subscriber, BBCpersian with 10000 feed subscriber are some of the examples why such a simple RSS news reader website changed to be one-of-the popular website in Iran. Where all blog provider services like Blogger.com and Wordpress.com are also banned, many weblogs owe their readers to Google reader and some also use notes as a weblog post or tweet. Unintended consequences; Google might be well-advised to rethink the decision. As of early evening Tunis time the officially declared results were in for 159 of the 217 Constituent Assembly Seats and the totals were 65 for Al-Nahda, the CPR and Aridha Chaabia nearly tied for second with 23 for Aridha and 22 for CPR (for these parties see my post of yesterday); Ettakatol with 13; the PDP with 7, and the rest scattered among many other parties. This still does not include official returns from the two Tunis constituencies. Many estimates are that Al-Nahda will end up with something around 88 seats in the 217-seat Assembly. Final results are not yet available in Tunisia but the overall result remains the same as in my analysis last night: Al-Nahda a strong first, then the CPR, then dark horse Aridha Chaabia. Issandr at The Arabist, who has been visiting for the elections, reports his impressions and some of the inevitable conspiracy theories swirling about. More when returns are complete. Tunis is apparently not yet reporting. The killing of Khaled Said in Alexandria in June of 2010 was one of the earliest sparks to the Egyptian Revolution, and the Facebook page "We Are All Khaled Said" helped rally the revolutionaries. Now, almost a year and a half after the fact, two policemen have been sentenced to seven years in prison for the death. It is a reminder that however much the Egyptian Revolution has been waylaid, sidetracked, or hijacked by the Military Council, there is still some progress in some areas, and pressure for more. I've already posted about Al-Nahda's success, and of those 101 seats it had won 43, or a little over 40% of the Assembly. That is unlikely to change; in those constituencies declared so far, including urban and coastal cities where it was not expected to run as strong as in rural areas, Al-Nahda had placed first or second in all as of this afternoon. This included Ben Ali's old home base of Sousse. But you know that already: Al-Nahda in the lead has been the headline in just about all the international media. What's a bit more surprising is the rest of the field, which is running well behind, with a favorite trailing far behind and one dark horse that has performed surprisingly well. The People's Democratic Party (PDP), led by Ahmed Nejib El Chebbi, was a legal opposition party in the Ben Ali years, founded in the 1980s. The PDP is left of center and outspokenly secularist; it has strongly opposed Al-Nahda and has said it will not join a unity government or coalition with al-Nahda. Most polls had shown it likely to run second to Al-Nahda. But some PDP members felt Chebbi was emphasizing fundraising over principle and giving places on the party list to large donors; also the PDP has supported a strong Presidency (by which Chebbi clearly means a strong President Chebbi), and strong Presidencies are something many Tunisians want to put behind them. Still, I think a lot of Western observers expected the PDP to run second to Al-Nahda. No such luck. Of those 101 seats so far declared, it has won only five, and is running fifth. Actually in second place is the Congress for the Republic (CPR), led by Moncef Marzouki, which has 16 seats so far. Marzouki, a human rights activist, spent the past decade in exile in France, where the party functioned among Tunisian expatriates (who are represented in the Assembly with 18 seats, 10 from France alone. Al-Nahda won 9 of the 18.) For what it may be worth, Marzouki actually reached out to Al-Nahda during the campaign and met with its leaders, and has said the CPR would consider a coalition. Some thought that would doom him with secularist voters, but instead it may have helped the CPR, just as the PDP's adamant refusal to talk with Al-Nahda may have hurt them with voters. Most predictions expected the Democratic Forum on Labor and Liberties, known from its Arabic name as Ettakatol, to run in the top few positions. It was also legal under Ben Ali, but only legalized in 2004. With 10 seats out of the 101, it is doing all right. But the party running third after Al-Nahda and the CPR but ahead of Ettakatol and the PDP, is the real dark horse, with 12 seats so far. Many of the media guides to "major parties" did not even include it; with over 100 registered parties, most are not taken very seriously, but this dark horse is running third. This is what is known as the Aridha Chaabia, from the Arabic of its full name, the Popular Petition for Freedom, Justice, and Development, led by Mohamed Hechim Hamdi, who is a Ph.D. in Contemporary Islamic Studies from SOAS in London (unusual in Tunisia, where most academics have their degrees from France or Francophone institutions). A number of other parties have won from one to three seats each. So far, with 101 of 217 declared, one should add to the headlines everyone is running about Al-Nahda that it is running strongly everywhere, domestically and among Tunisians abroad, but that the PDP ran poorly, while the CPR (and Ettakatol, which is also willing to talk coalition with Al-Nahda) did rather better, and the dark horse of Aridha Chaabia seems to be the surprise. In other words, hey, real elections where the outcome surprises people! Meanwhile, at Foreign Policy, Erik Williams declares the elections a success before all the votes are in: they were non-violent, had a big turnout, were pluralist, and were fair: Al-Nahda was allowed to win. If later results substantially alter my reading above, I'll update accordingly. Prince Sultan Funeral Given Unusual Coverage? I don't want to overemphasize this since it may just be a reflex of 24-hour news channels and the need to fill coverage, but today's funeral of the late Saudi Crown Prince Sultan strikes me as getting more press and television coverage than has usually been the case in the Kingdom. Under the Wahhabi tradition, which strongly opposes the cult of saints and the veneration of tombs, even the Kings are buried in unmarked graves. While the coverage shows the usual austere funeral prayers, there seems to be more reportage than usual in the Kingdom. Part of the coverage may just be due to the unusual circumstances in this case. Since Sultan died in New York, such photo ops as senior officials meeting the body at the plane, etc., provide visuals not usually available in such cases. But I also wonder — and again, I don't want to overstate this — if the Kingdom feels that with the death coming in the year of Arab revolutions and days after the killing of Qadhafi, that the funeral and the coming designation of a new Crown Prince could provide an opportunity to reassert the ruling House of Saud's claim to legitimacy and to display continuity and stability. Again, it could also just be that in the six years since King Fahd died, news channels have proliferated and thus coverage has increased,but I thought I'd note the first impression. I'll be blogging later about the Tunisian results as they solidify. Meanwhile, for your reading pleasure, The Arms Control Association's blog discusses the problems of the Iranian space-launcher/ballistic missile prograsm, in the wonderfully-titled "Iranian Ballistic Missile Program: Non-Barking Dog and Dead Monkey." Tunisia's Al-Nahda (or Ennahda, Annahda, etc.) Party is by all indicators leading the vote count with a strong plurality; the Party itself says it will win at least 30% and hopes for 40% in the vote for a constituent assembly. The secular parties are well behind, splitting the secular vote several ways. Once the final results are in, there will be a hue and cry among many Western commentators, who fear that Arab Spring is really going to result in an Islamist wave. I would urge everyone to calm down and await developments. Al-Nahda leader and chief thinker Rached Ghannouchi has always insisted that he supports Tunisia's traditional openness on women's rights and points (as do other Islamists these days) to Turkey's AKP Party as a model of a party of Islamic roots but functioning within a secular society. Partly educated at the Sorbonne, he once dabbled with Nasserism, Syrian Baathism, and European-style socialism; he is not a stereotypical Islamist anymore than Tunisia is typical of other Arab societies. And he spent his years of exile not in Saudi Arabia or Yemen or Afghanistan, but in London. Skeptics note that not everyone in Al-Nahda has always spoken as liberally as Ghannouchi, and one can cherry-pick quotes from Ghannouchi to raise alarms as well. Also, at 70, it's not clear whether the younger Islamists in the party, who grew to maturity during the years Al-Nahda was suppressed by the Ben Ali government, share his liberality. The other point to make is that these being the first elections in Tunisia or anywhere since the revolutions of 2011, it is hardly surprising the parties that existed (albeit in opposition and without power) under the old regime have a better chance of success: after all, if Ben Ali repressed them, they must be on the right track. There is plenty of nervousness among Tunisian secularists about what a strong poll by Al-Nahda means, but that's because no one is really sure. Although Islamists have held Cabinet posts in Jordan, Lebanon, and occasionally elsewhere in the Arab world, it's hard to judge how they will function in a real competitive system, except by analogy to very different countries such as Turkey or Malaysia. When relatively free elections were about to produce a victory for the Islamic Salvation Front in Algeria in 1992, the Army intervened and a civil war followed. It's important, too, to bear in mind that precisely because Al-Nahda presents itself as a different sort of Islamic Party, many of those who voted for it may not be seeking a hard-core Islamist government. So long as Al-Nahda plays within the system, willing to form coalitions and make compromises, there may be little cause for concern. We are simply entering in to a whole new era in which elections are real, and that means the old expectations may not apply. Al-Nahda will not have a majority unless the final vote shows a bigger sweep than most estimates do; it will have to cut bargains with others. Nor are Tunisians electing a government, exactly; the Constituent Assembly will set up an interim government while it writes a new Constitution, but Al-Nahda and other parties have said they favor a technocratic national unity government for the immediate period. True, I wouldn't have voted for Al-Nahda, but I'm not a Tunisian. Al-Nahda's actual performance and willingness to work with secular parties will be closely watched (especially, I'm sure, in Egypt). Democracy does not always mean the vote will go the way we want it to (that's how the old regimes worked). Before the commentariat erupts with much viewing-with-alarm, let's watch the process and hope that Al-Nahda means what it says. 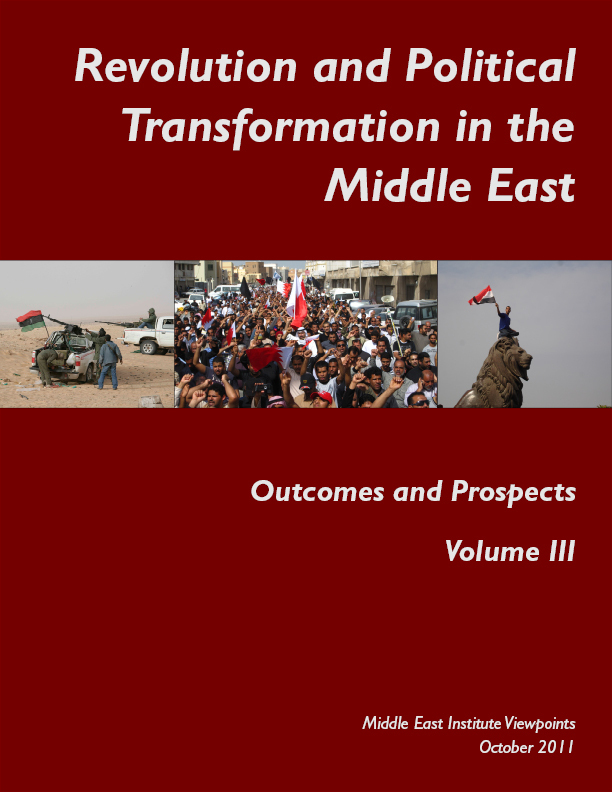 The third volume of the Middle East Institute's Viewpoints series, "Revolution and Political Transformation in the Middle East: Outcomes and Prospects" is now available. The information page is at the link: Full text in PDF here. 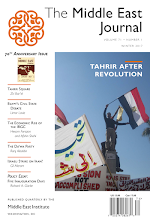 It contains five articles, including one on a lot of our minds today, on Tunisia. For the earlier volumes, see here and here. Virgin Mary Said to Appear in Cairo and Alexandria on Friday: A Symptom of Sectarian Tensions? 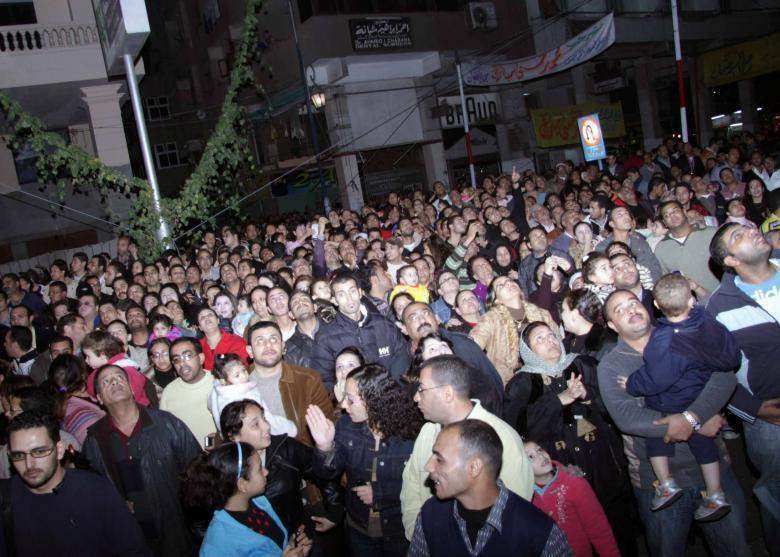 On Friday evening, thousands of Copts and perhaps others in Egypt gathered to watch some sort of lights in the sky, in both Cairo and Alexandria, and word spread that it was an apparition of the Virgin Mary. Another story here, this one in Arabic. The Alexandria videos do show something, perhaps a searchlight; the Cairene sightings may also show something, but exactly what is debatable. This may remind my longstanding readers of the wave of Marian appearances back in 2009, which I blogged on, complete with YouTube videos. As I commented then, if it's actually the Virgin Mary, it's above my pay grade, but if it's a sociological phenomenon produced by growing sectarian tension in the country, it's fair game for commentary. Coming just after the Maspero killings, and at a time of deepening societal tension in Egypt, one need not accept that this is miraculous to understand the popular reaction. The Virgin Mary plays a special role in Coptic tradition, since the story of the Flight Into Egypt in the Gospel of Matthew tells us that the Holy Family visited Egypt while Jesus was an infant. Coptic tradition has inflated the few verses in Matthew into a detailed itinerary, complete with miraculous stories and visits to practically every Church along the Nile (and quite a few mosques). Because of the Holy Family stories, many Muslims also venerate these sites, since Mary plays a major role in Islamic tradition as well. When the first major Marian appearances took place in Matariyya in 1968, near a site venerated as holy to Mary, there were as many Muslim witnesses as Christians. (See my link from 2009 above.) That 1968 was the year following the humiliating defeat in the Six-Day War of 1967 and the loss of Sinai may not be entirely coincidental. There were Marian apparitions reported in 2000, 2007, and a wave at Christmastime 2009, the first of the real YouTube era, but also an era of sectarian tension and growing political dissent. Those videos (at the link) looked like some sort of electrical arcing of electric lights in one case, and Saint Elmo's Fire in another, but perhaps I'm too skeptical. Friday night's sightings occurred 12 days after the killing of Coptic demonstrators at Maspero, the worst sectarian violence in years. Tensions are high; signs in the sky will be interpreted accordingly. Of the following video clips, in those where I can see much of anything at all, it looks clearly like a searchlight on the clouds, so the first comment above, from Alexandria by the place names mentioned, would seem somewhat credible. "Very very urgent: Appearance of the Virgin in the skies of Shubra [populous, heavily Christian part of Cairo] yesterday." I can't see much here, to tell the truth. "Appearance of the Virgin Mary above the Church of St. Maximus and Bishop Musa al-Aswad in Alexandria": This, I think, is consistent with a searchlight on the clouds. And this time, "Appearance of the Virgin Mary and the Archangel Michael Above the Clouds." I admire the specificity, though I only see one light, and I think it's a searchlight. Early reports say that over 90% of registered voters turned out for Tunisia's first genuine competitive elections. Even unregistered voters were allowed to vote. 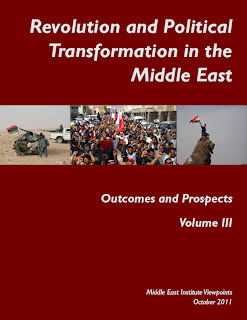 The Arab world is used to "90% turnouts," of course, but this time it may be true. (Those elections also used to go 95% for one party.) With something like 111 parties total (though not all on any single constituency ballot), people really have something to choose from. The Arabist reports his impressions on the changed mood of the country. More as the results become known. It's past midnight on a Friday night and I won't try to analyze, but in the past half hour to an hour there have been multiple reports, some very credible, that Saudi Crown Prince Sultan, about 83, has died in a New York hospital. (Confirmed by Royal Decree a few minutes ago.) Since King ‘Abdullah just had back surgery a few days back, the death of the Crown Prince (and First Deputy Prime Minister, Minister of Defense and Aviation and Inspector General of the Armed Forces) comes at an awkward time, especially for those who worry that Interior Minister Prince Nayef will now formally become the heir apparent, which he already is informally. This could be a fox-in-the-henhouse moment for the House of Saud. More when more is known. 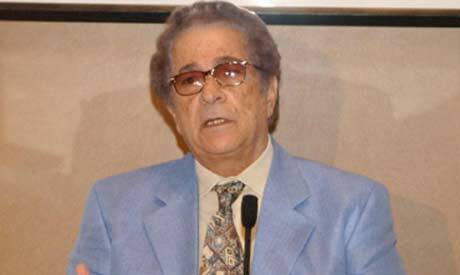 Anis Mansour, Egyptian writer, journalist, editor and columnist, has died at age 87. Obit here. Novelist, memoirist, journalist (he wrote for most of Egypt's major publications, most recently as a columnist in Al-Ahram), Editor (he served as Editor-in-Chief of the weeklies Akher Sa‘a and October, the latter in its influential early years under Anwar Sadat). A pillar of the old journalistic establishment gone. If you're doing the math and wondering how 1925-2011 can make him 87, I assume Ahram Online computed his age in Hijri years. But the short form is that Brigadier General Charles Pomeroy Stone (left), overall commander in the theater at the time, became the scapegoat for the battle. 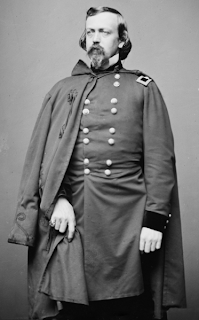 The real blame fell on the commander on the scene, who was a US Senator, close friend of Abraham Lincoln, and had the good judgment to die on the battlefield. Stone accordingly was not only blamed, but actually imprisoned. Eventually released, his career in the US Army ruined, he sought new employment. And he found it: Chief of Staff of the Egyptian Army. The Khedive Isma‘il was recruiting officers to remake his Army, and since he suspected the European powers of colonial ambitions in Egypt (hint: he was right), he turned to the Americans, who after the Civil War had plenty of experienced soldiers looking for work. 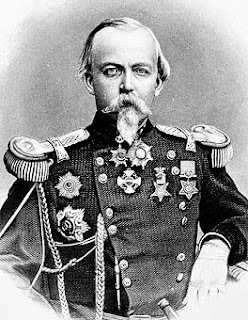 He hired both Yanks and Confederates, and they served together. My earlier post linked above goes into a lot more detail on this. Stone served longer than most, serving Isma‘il and then Khedive Tawfiq after him. He held the post of Chief of Staff of the Egyptian Army from 1871 to 1883, when, the British having occupied Egypt, he was finally replaced. The photo at right shows Stone, by then known as Stone Pasha, as a Lieutenant General in the Egyptian Army. The Khedivial uniform is fancier, to say the least. They're doing a reenactment at Ball's Bluff this weekend. I wonder how many of the reenactors will be aware of Stone's Egyptian role, which lasted a lot longer than his career in the US Army? Metaphors about Jim Jones and the People's Temple suicides back in 1978 may be lost on a lot of younger readers today, but Juan Cole goes there in an interesting metaphorical venture, and it's worth a read. Of course if the new leaders of Libya are right that at least 50,000 Libyans died this year, Qadhafi took a lot more people with him than Jim Jones. I don't totally embrace Juan's analogy, since it sounds as if Qadhafi did not intend to die but to keep fighting, but it's worth considering. Well, not the Arab world or old Egypt hands, but Mahfouz gained his greatest fame after his 1988 Nobel Prize for Literature: "How the World Discovered Naguib Mahfouz." His 100th birthday is in December, so expect more on the subject here. To start your day: From her forthcoming memoir, Condoleeza Rice's memories of her meeting with Qadhafi. On the iconic history of the red "X," see this earlier post on a Time Magazine tradition. Too bad there's no symbol for "already blown up once, but still in power," for Salih. 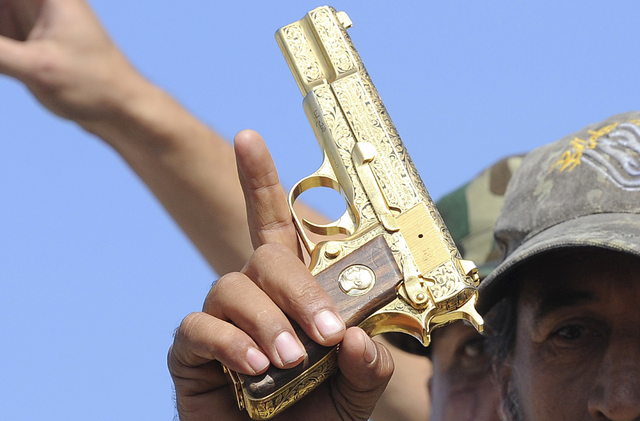 According to the fighters who captured Qadhafi, the deposed Libyan leader was wielding a golden or gold-plated handgun when caught, shown in the AFP photo at left. (Yes, that's a New York Yankees cap.) Given Qadhafi's flamboyant dress styles, a gold-plated taste in personal defense weapons may seem logical, and as this Atlantic article notes, other gold weaponry was found in his compound in Tripoli. From the latter link, a closeup shot below. What Does Libyan Outcome Suggest for Syria? The Shalit Deal: This Time for Real? The Egyptian Army: Turning to the Dark Side? October 6 and a New "Crossing"
Saudis Blame Qatif Riots on "a Foreign Power"
Could Arabs Win TWO Nobels This Year?